In football we all know the 2 main phases that make up a match: possession and non-possession of the ball, but very often we neglect a "moment" that is decisive for the purpose of a result. The transition is the time that elapses between the possession phase and that of non possession of the ball (and vice versa), a situation often neglected and even more often not trained. The greatest difficulty encountered in managing this third "phase" of play lies in teaching the group an elastic attitude, ie the ability to move from a positive situation (possession) to a negative situation (non-possession). Each player during the game must assess the possibility of a transition (positive or negative) and even before the same occurs, he will have to analyze the possible moves or countermoves. "Nina" do not be afraid to throw a penalty: It's science! Just a lottery? Nothing could be more wrong: this is shown by detailed studies. For those who believe in destiny, in fate, or more simply in chance, the following has no reason to exist. Yet mathematics is not an opinion and certain numbers often say more than you want to believe. Among the eternally most debated topics in the world of football are the rigors: their nature, their outcome, the justice and veracity of a result decided according to many by fate, nothing more. Then there is the party of those who firmly believe in the 11 meters as the maximum summary of the sport, which puts you to the test on a mental level, even before technical: with yourself, even before that with your opponent. In the middle, there is science and some statistical data that would seem to leave means that the penalties are anything but a mere lottery. All fault or all merit, depends on the point of view, Professor Igacia-Palacios Huerta of the London School of Economics who took the trouble to analyze well 1.343 of penalty kicks kicked in 129 games ended in a tie. A data large enough to draw more or less reliable samples, which can go beyond randomness. Among the most sensational data published exclusively by sports.bwin.it it emerges that according to which over 60% of the victories of a team depend on having started first the lottery of penalties, obviously realizing it. The nervous factor during the execution of the 11 meters is obviously fundamental: the 76% of the penalties at the end of the game are made, against 85% in the 120 regulatory minutes. 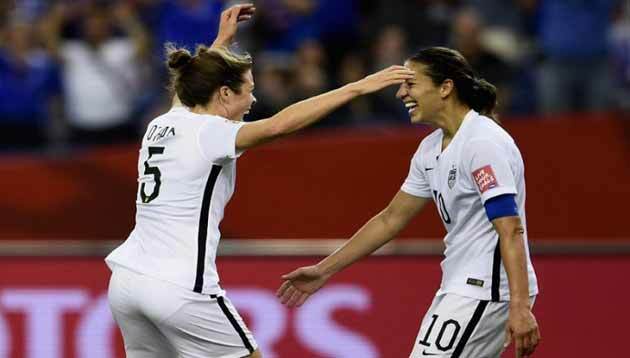 Read more: "Nina" do not be afraid to throw a penalty: It's science! Let's go and discover the activities of "FootbalLab", a company specialized in the individual technical training of the player affiliated with calciodonne.it for the initiatives"calciodonne rewards you, sail and win"and the survey" the strongest players. "FootbalLab provides its services to players, mister and company in the form of coupons and prizes, and we look forward to learning more about FootbalLab and discovering their professional proposals. FootbalLab is born from the meeting of: passion, sharing, ethics and professionalism to support children and young people in their path of sports growth. It is an "Interactive", Integrative, Itinerant and Innovative "Laboratory". The Logo represents the metaphor of growth, evolution and development, as well as children, looks to the future as a process of maturation. 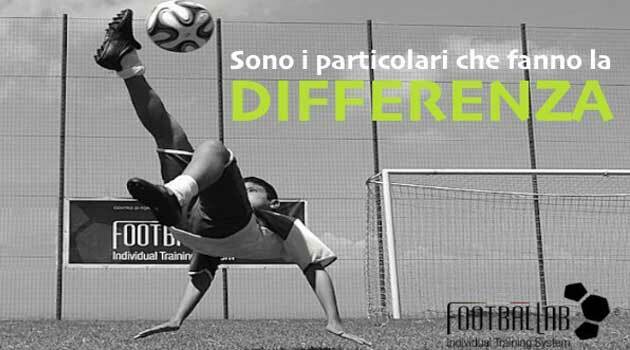 It is the first center in franchising in Italy that deals with Individual Technical Training, which adopts a particular multilevel methodology in customizing football lessons that can accommodate any type of user. The highly psychological aspect of the method allows you to transmit security in your abilities, implicitly making children and adolescents free to express themselves and their attitudes in complete serenity. Each coach has a favorite game system with which he has his team in the field. A game system to which it has come through its own experience as a player, from that assimilated by the coaches he had, but above all from his past experience in the field as a coach, confronting himself with the daily difficulties in training. The game of football evolves continuously both under the physical aspect (speed, strength, resistance) and the technical-tactical one. A series of "specials" aimed at making known the structure of women's football clubs begins with the study of technical organization. 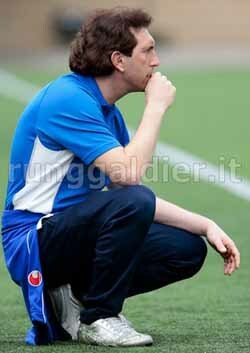 I chose to start this intriguing journey starting from the technical area, fundamental department for the programming and development of the performance of the single athlete and the results obtained by each team during a football championship, to continue successively with all those thematic areas that complete the organization, under development, of every women's football club. The ready availability of a large part of the clubs and the collaboration of Rita Guarino - footballab.it - they allowed me to continue the study through a simple questionnaire sent to all the companies interested in making their organization known. Verona has anticipated the adversaries and already from the next days we could "enter" inside the Gialloblù society and discover the organization supporting the performances of Gabbiadini and companions .. The transition is the time that elapses between the possession phase and that of non possession of the ball (and vice versa), a situation often neglected and even more often not trained. The greatest difficulty encountered in managing this third "phase" of play lies in teaching the group an elastic attitude, that is, the ability to move from a positive situation (possession) to a negative situation (non-possession). In this article I will try to give some very synthetic ideas related to zone markings. Teaching this type of defensive tactics is often complicated, and you need to spend a lot of time during training sessions. 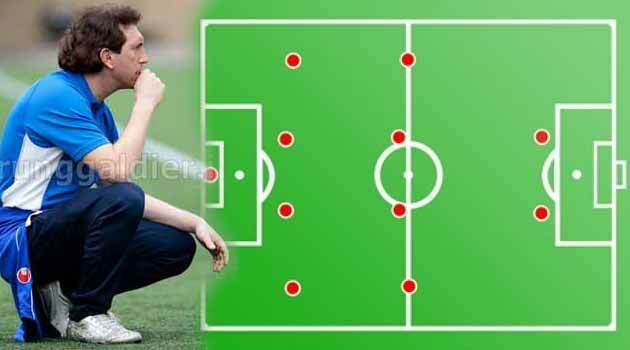 In addition to the movements, the coach will have to take care of the times of execution of a defensive strategy (diagonals, triangle, overlaps and slips in the various lines) and carefully analyze the spaces between players and the various departments. Normally I perform some theoretical sessions, trying to show the basics that regulate this type of marking, then move on the field showing the movements and making the various situations try. I've always been helping (in the early days) with a rubber band that binds the various defensive lines (in the case of the 442 - 4 defenders and 4 midfielders). The elastic has the function of making the department compact and give the correct spaces between the various players. We do not contest this choice ... National "World Champion"
The communication relating to the appointment of the new technical commissioner for the women's national team, did not surprise me much, in fact, it was years that I expected that there was from the Club Italia, a sensitive exploitation of our movement. 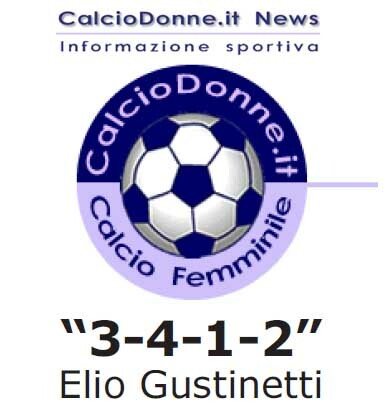 With the appointment of Antonio Cabrini, I think I start a new course for women's football, in fact, never before had it so far been aimed at. A world champion in charge of our national team, I believe that it is a real recognition to our movement and I do not sincerely understand the criticisms or the positions taken towards this decision. Finally, even in Italy, the importance of developing this sport has been understood with important actions like this, which will help us to give credibility and find space on televisions and newspapers. A sport like a company, lives if it is recognized and advertised, dies, or has no growth if it remains in its own limbo. This concept is at the basis of marketing and today we have a unique opportunity that we must absolutely exploit. Read more: We do not contest this choice ... National "World Champion"
Silence ... falls asleep .. The project "Trentino Maddalene" which will be born next year, brought me back to the Trentino camps to see the level of our regional championship with the aim of understanding the evolution that in recent years has been in the lower categories. I was struck by the good athletic training put in place by the girls, the resistance and the ability to manage the 90 minutes. The individual technique on the whole is better than before, even if the collective is sincerely absent and I have not noticed logical schemes of play, but only the attempt to reach the opponent's door randomly. Read more: Silence ... falls asleep ..